Hi, I'm Stephanie, and my favorite hobby is creating on my sewing/embroidery machine. I recently moved from Orlando, Florida to Utah and those are my three stripling sons standing in front of the Missionary Training Center in Provo, Utah quite a few years ago. (I went to get an updated picture recently and would you believe that the sign is no longer there!!!) I also have two beautiful daughters and a fabulous husband. He is the genius behind my website and I love him for learning how to do this for me. He's my model for the Elder's apron and yes, he served in the Puerto Rico, San Juan, mission just like his apron reads. I am the one standing right next to him in the Florida, Orlando, mission apron. In fact, the name tags at the bottom of the homepage are all family members who have served missions to various parts of the world. It's not a complete list, but I hope it continues to grow. I am hoping that by selling these missionary aprons I will be able to help finance the missions for any of our children who serve someday. 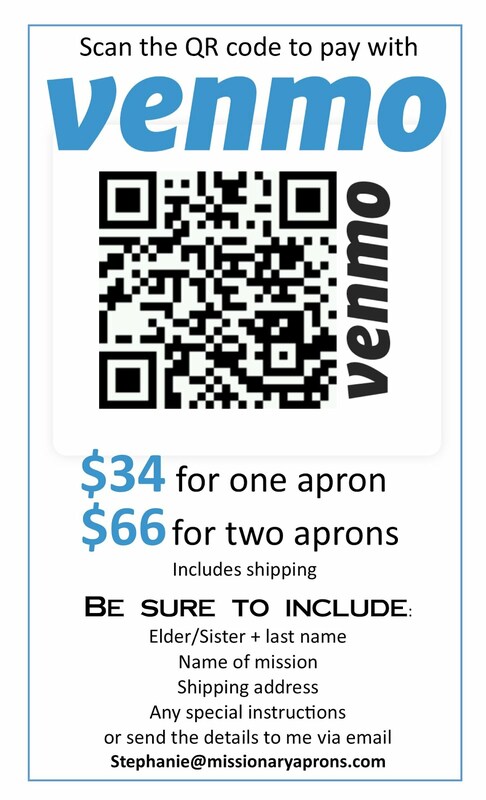 So, if you decide to purchase a Missionary Apron for the missionary in your family, ward, or neighborhood, you will be helping us finance the missions of our children. Thanks in advance! I thought I would tell you how MissionaryAprons came to be. It was Christmastime 2007 and our family's turn to buy presents for my oldest sister's family. Their son had recently received his mission call to Rome, Italy. I asked my sister what he still needed. She told me that he had just about everything, but he didn't have an apron. I bought a black apron at a local craft store because I thought it would hide any spills and stains better than a white one. I was about to embroider his name and mission on the apron when my oldest daughter made the suggestion that I ought to make it look like his black name tag. What a great idea! I embroidered him my first missionary apron. I made his apron to look exactly like his name tag, church logo and all. It turned out so nice that I spoke with my husband about the possibility of creating a website and selling them to help finance our sons' missions one day. He thought it was a great idea, but told me that we wouldn't be able to use the Church's logo. As we talked about alternatives, we came up with the idea to use their mission name instead and design it to look like the Church's logo. We weren't sure if we could do that, so our first phone call was to the Church's intellectual property office. We explained our idea and they told us that it was fine to design the apron to look the black name tag, as long as we didn't use the Church's logo. You might find it interesting to know that we were also told we couldn't use a likeness of the figure of the angel Moroni or the CTR shield as they are both trademarked as well. Our next step was learning about purchasing a website domain and how that was different from web hosting. We also didn't know anything about creating a website, especially one that was an e-commerce site. Once we bought the domain name, thankfully there were some basic templates we could use to put the site together, but we still needed pictures and a logo. My husband designed our logo and with our simple point-and-shoot camera we took some pictures of the aprons. Our final step was to locate a distributor of bulk aprons. It finally all came together!